Example of rain in the Southland in a prior storm. MyNewsLA.com photo. Mudslides, flooded freeways and dangerous driving conditions plagued the Southland Thursday thanks to a second straight day of rain, prompting road closures, mandatory evacuation orders in Orange County and fears that the situation could get much worse before the storm moves out. In Orange County, voluntary evacuation orders were issued Thursday morning for select neighborhoods near the Holy Fire, affecting the Trabuco Creek, Rose Canyon and Mystic Oaks/El Cariso areas. By early afternoon, however, the evacuation order was elevated to mandatory for Trabuco Creek, and residents in Rose Canyon were asked to shelter in place due to road closures at Trabuco Canyon Road at Rose Canyon and Plano Trabuco Road, according to Carrie Braun of the Orange County Sheriff’s Department. Many drivers in Orange County were found themselves stuck in flooded streets, but no one has been hurt, said Orange County Fire Authority Capt. Tony Bommarito. 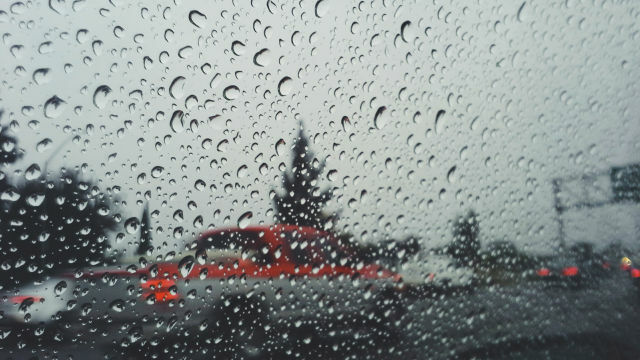 A less serious flood advisory was in effect for Los Angeles County until 1:45 p.m. NWS officials said heavy rain was possible in areas such as Diamond Bar, Pomona, La Verne, Glendora, West Covina and Mount Wilson, but also in Long Beach, Palmdale, Hollywood, Van Nuys, Culver City and Torrance.